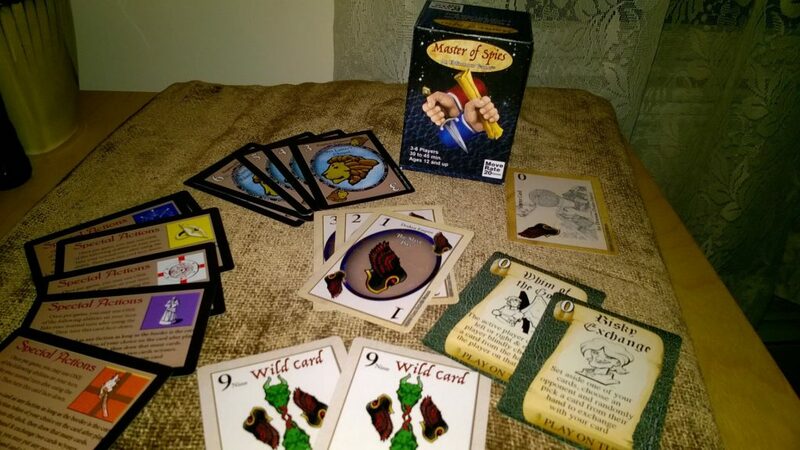 Card Game Update; Work continues “Master of Spies”! What’s up with this Card Game? 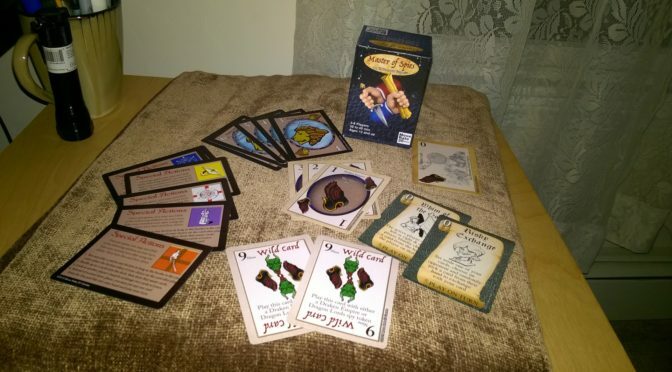 Card game play mechanics are just about complete and the official rules have been written. A couple of new “Action” Cards have been added to the game to smooth out game play, and a few have been removed since they did not “make the cut” during play-testing. All the artwork for Master of Spies has been finalized and will soon be added to the card game. A new design for the game’s “chits” has also been completed and will be manufactured in the same time period. New prototype decks will be produced using this artwork and review copies will be sent out to some game review websites very soon. 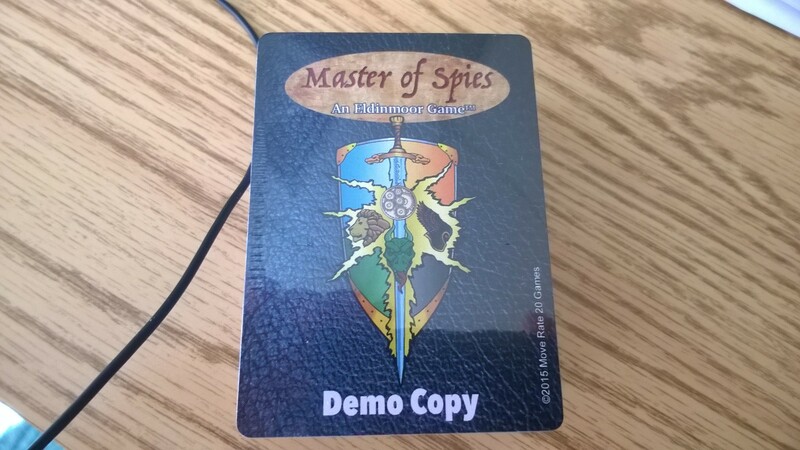 So far the clear majority of our recent play-tests for “Master of Spies” have resulted in positive feedback, so we are excited to move forward into the next stage of development. Hopefully we can bring “MoS” to Kickstarter soon (Early 2017? Keep posted). We still have some play-testing notes to comb through, but overall this card game is very close to going into production. What’s next? We’ll be digging out our second game, clean away the dust on it and resume development on that one as well, Rob has also teased us with a project he has been developing that has some local flavor! Things continue to be busy here at MR20! Final Kickstarter Update, and A Thank You to all backers! Well, we didn’t quite make it. Still, this has been a very positive experience for all of us at Move Rate 20. We’ve learned so much about the process. and gotten some great feedback. And to have acquired over 100 backers for our first project tells us that we’re not far off. So, THANK YOU so much to all our supporters, everyone who backed the project, and took the time to like & share our posts, we really appreciate it! Now we’re going to take a little time, apply everything we’ve learned, retool things a bit, then come back with a new & improved campaign later this year. We hope we can count on you all again when that happens, but regardless, thank you all again for everything. 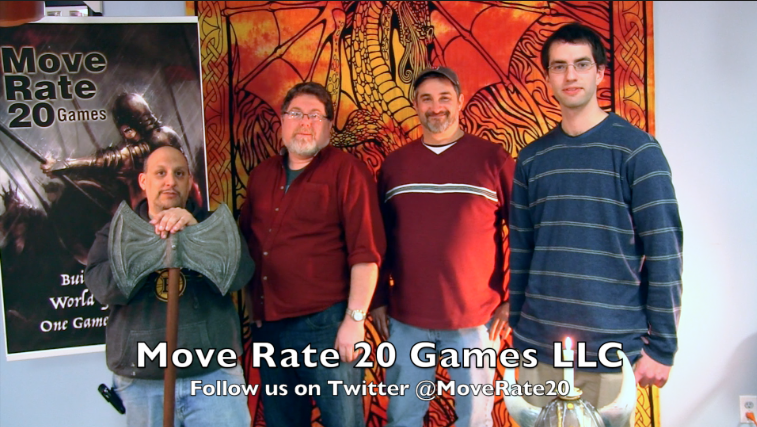 We’ll be posting updates on our progress via the Move Rate 20 website, Facebook pages & Twitter (@MoveRate20). In the meantime, enjoy the weather, and we’ll see you all again later in the year! 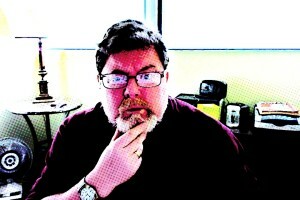 Will the last 24 Hours of the Kickstarter be as exciting as the first? It all comes down to the next 24 hours (where’s Kiefer Sutherland when you need him). We are a little less than $2,500 short of our Kickstarter goal. A long shot? Yes, but we’re not going down without a damn good effort. 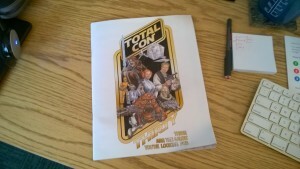 As I’ve said in earlier posts it’s been a learning experience and I plan on writing a blog post after similar to my “5 Things I Learned About Myself At TotalCon 2016“, but I need to wait to see how the story ends. Of you are reading this before March 30th 10:00am EST, please got to our Kickstarter page and back us! Share with your friends.! If we don’t make it, it’s not the end, we’ll take what we learned and revamp, retool and rest the campaign in a few months and try again. Thank you for your support, no matter how small, it all means a lot! 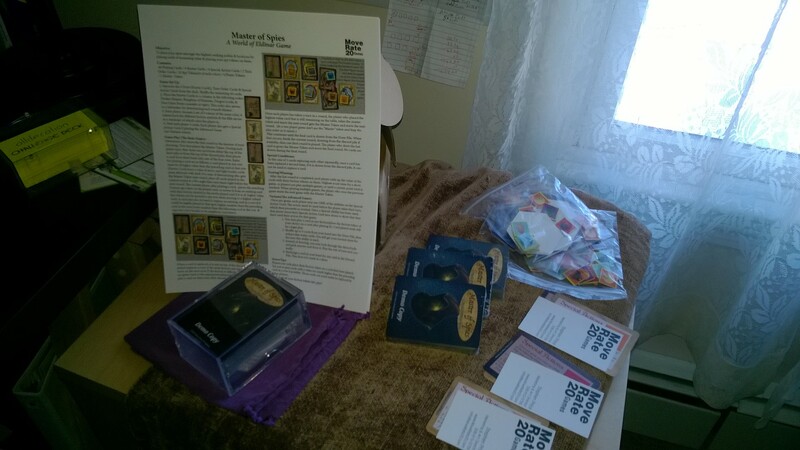 We got a nice write up about “Master of Spies” on the “Care And Feeding Of Nerds” website. It’s a nice FAQ that allowed us to explain Master of Spies a bit more and the process behind it. 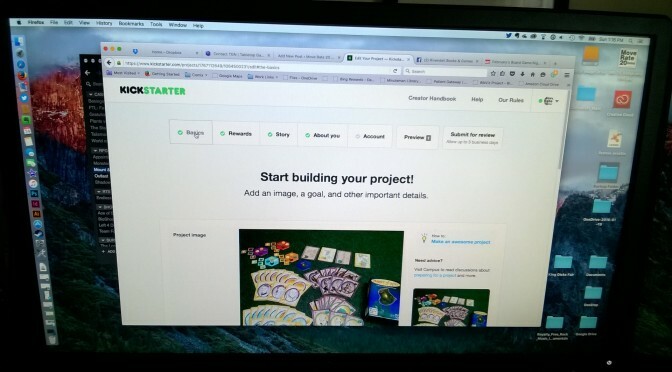 Our Kickstarter Is A “GO”! After a year’s worth of work, the Kickstarter is finally here! It’s a very exciting day for us here at Move Rate 20 Games as we launch our first (of many, hopefully) Kickstarter campaign. We’ve set what we believe is a very modest goal and reasonable backer levels, since this is our initial delve into crowdfunding. It’s a momentous moment for us as after this, we will never be Kickstarter virgins again! For now though, we are ready for whatever happens, or as ready as we can be, we hope. Please be sure to check our our Kickstarter page, back us if you’re interested in playing a fast, fun, quick to learn card game. 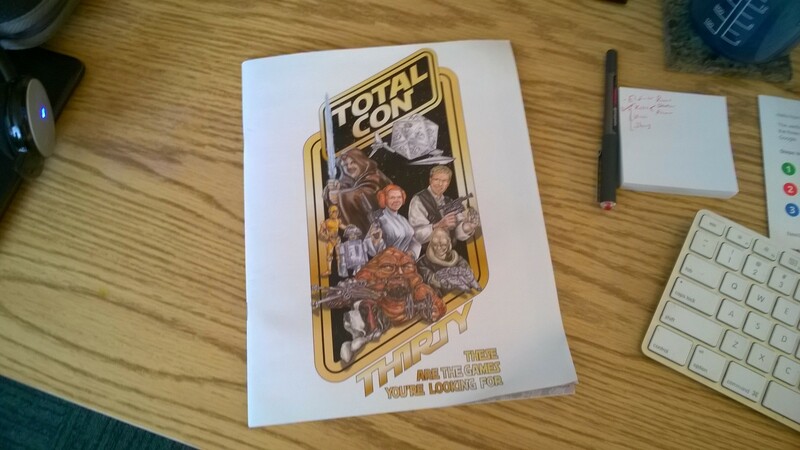 Total Con 2016 has come and gone. For us at Move Rate 20 Games, the last year was spent play testing, making demo copies and planning for this, the 30th year of Total Confusion and it all came together perfectly, though not without a few bumps along the way. But, I wanted to focus in the blog on what I learned about myself over the convention and the previous year in prepping for it. 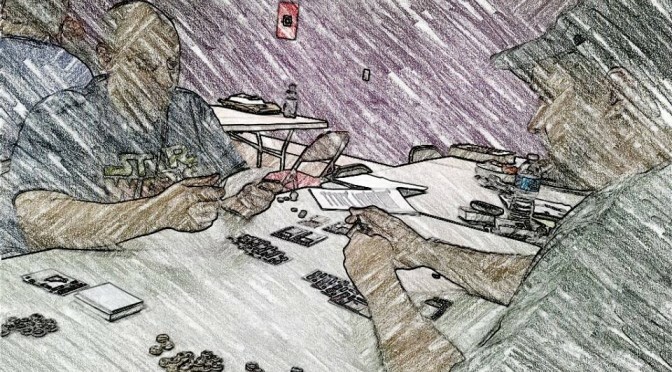 I love to teach kids how to play games. When they are into it, you can’t get a better experience than explaining how a game is played to a young mind. They pick stuff up so fast and in doing so enjoy the game so much quicker because they grasp it within a few minutes. James (a.k.a. 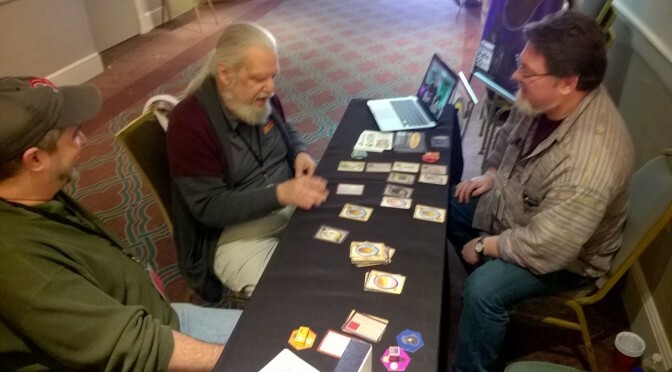 The Gamebreaker) and we came to the agreement that younger players don’t have and preconceived notions about what a game is or wondering if the mechanic is the same as another game they’ve played; they just want to play and have fun. Not every game is for everyone. This is a no brainer, but it get’s driven home every once in a while, when a person sits down to play and you can tell their just not jazzed about your game, or they don’t see the “tactics” or “how the mechanic works” and let you know they’re not impressed. I’ve learned to deal with that, not take things personally, listen to what their saying (since if you hear the same complaint enough, it may be part of a larger design issue). Most of all I’ve learned to move on, think on all the other folks who played and loved it. 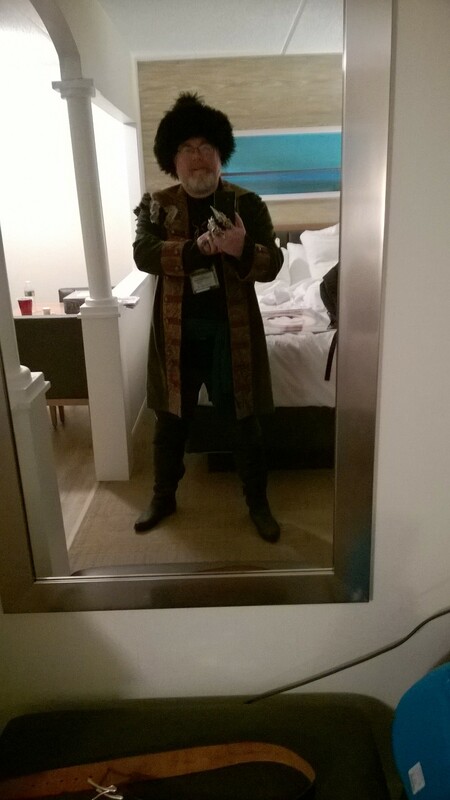 Here I am all dress up at Bartholomew Vahn-Mott, merchant and Trader in the world of Eldinar. including water, snacks and a fan. I like to think I come to an event as prepared as possible, which paid off. Since we we in an interior suite at the hotel I brought a small desk fan so the room wouldn’t get stuffy. Well, Saturday was unusually warm and being in an undershirt, a “blousey” shirt, a frock coat, plus a sheep wool and leather mongol hat, I was a little sweaty. So I asked my lovely wife Naomi to run back to the room and grab our fan. It was a life saver and prevent the frock coat from needing to get dry cleaned. Your Goals can be reached. Three years ago we set a goal to have the game we were developing at the time (a.k.a. 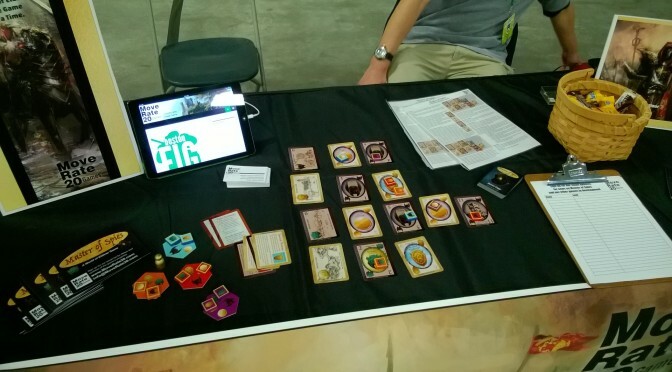 by its working title, Project Lightning Sword) ready to show our friends by Total Con 2015; which we did plus having an early version of Master of Spies to show as well. Our next goal was to be an exhibitor at Total Con 2016, have a Kickstarter ready to go and get Frank Mentzer to play test it. After a year’s worth of play-testing, networking and planning we managed to get all that stuff done. 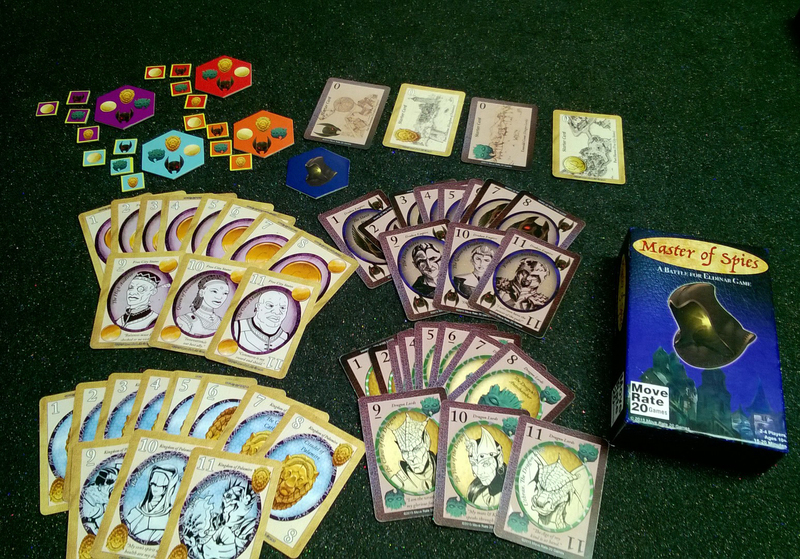 Our Kickstarter will launch in a couple days (Feb. 29th) and I believe we are as ready as we can be. 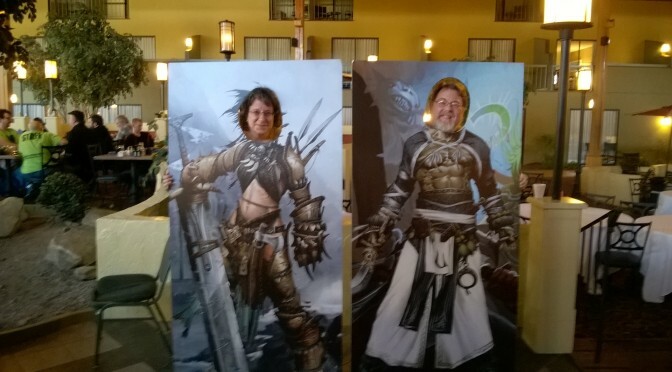 So there are the 5 things I learned about myself at Total Con 2016, now we begin to set our goals for Total Con 2017, which will probably have something to do with Project Lightning Sword getting a proper name and a Kickstarter next February. I know we’re been quiet here on the Move Rate 20 blog, but between the holidays, gearing up for the next batch of gaming conventions and getting our Kickstarter for Master of Spies set up, there just hasn’t much time to blog, Sorry about that! Anyway, we are planning for our Kickstarter to launch Feb. 29th with a modest goal of $6,000 dollars, you can see the preview here, please comment if you see anything that looks like it could be improved and please be constructive with any comments you make. 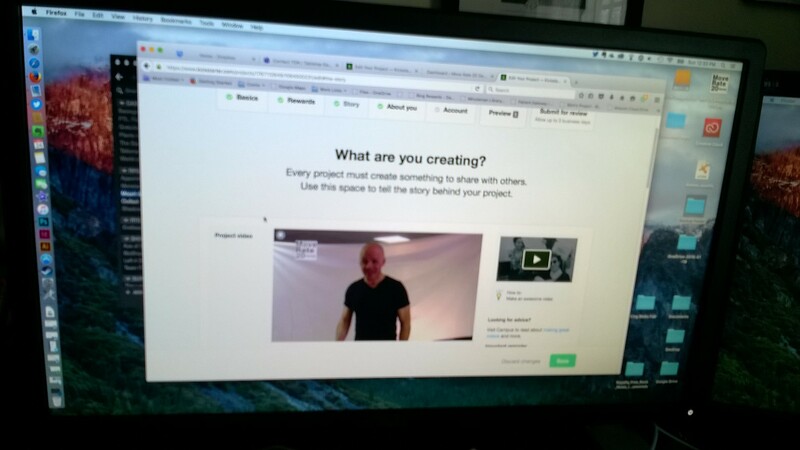 Working on the Kickstarter project page. 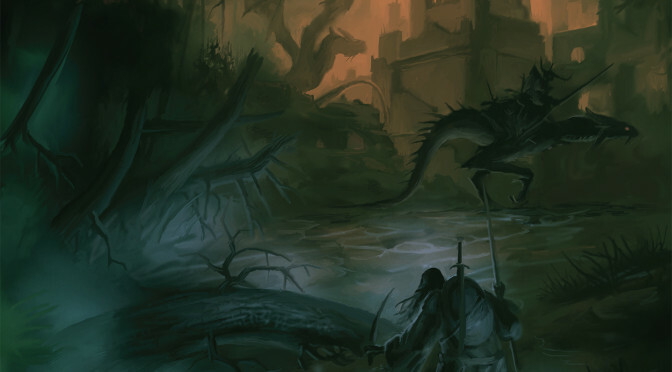 Setting up the campaign is about what I expected, work-wise; but it can be time consuming to gather up all the info the need as well as set up Backer Levels and Stretch Goal ideas that won’t completely throw off the budget. Another issue is how do you get a frickin’ package to Canada without it costing a fortune? I hope we can come up with some sort of a solution because I don’t want to leave my brothers and sisters to the North out of this. We’re also in the process of getting review sample together, admittedly we let this slip through the cracks, but I’m busily working on it! 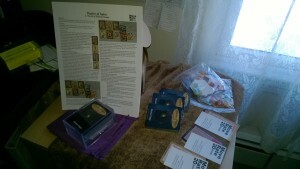 Putting the demo deck, rules, chits and contact card together after the big(?) snow storm of 2016. February Cons & Networking Events! So here’s a list of where we will be over the month of February to spread the word of our little game and demo it to the public. We will be there demoing Master of Spies Friday night 6p to 10p and Saturday from 2p to 6p. A monthly networking/Boardgame night for professional looking for fun and to connect, Meetup.com info here. We will have an expo table set up to demo the game and we’ll be there with our friends from Wyrmwood and Rivendell Books & Games. 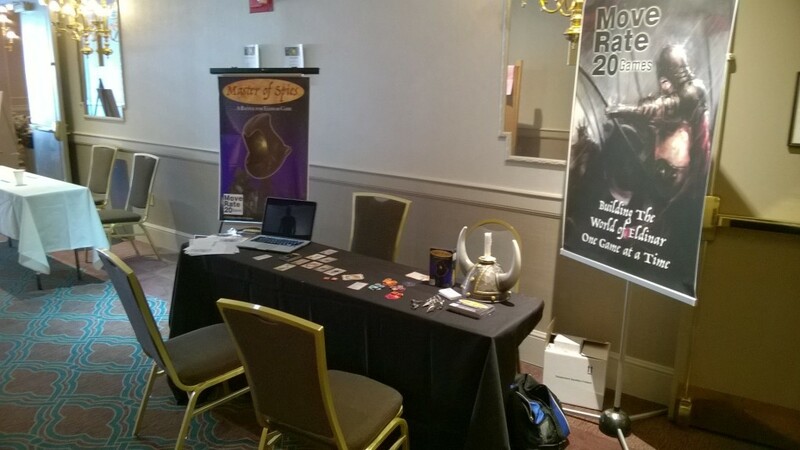 We are also hoping to get to a few demos at local gaming stores in over the next several weeks as well.